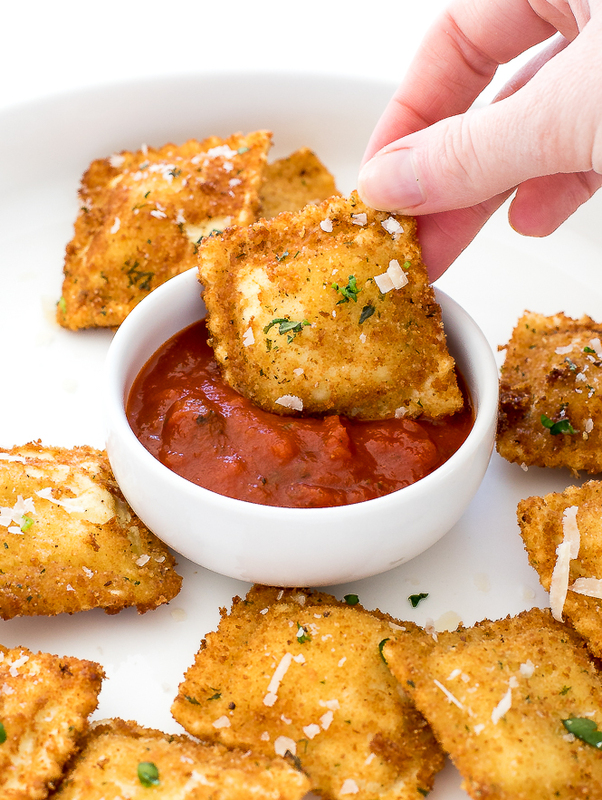 Toasted Ravioli. A super easy appetizer made with cheese ravioli fried until golden brown and topped with Parmesan cheese and fresh parsley. 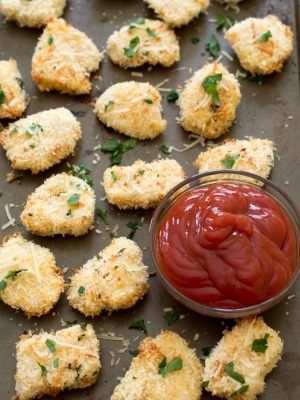 Serve with marinara sauce for dipping! I just found my new favorite appetizer! 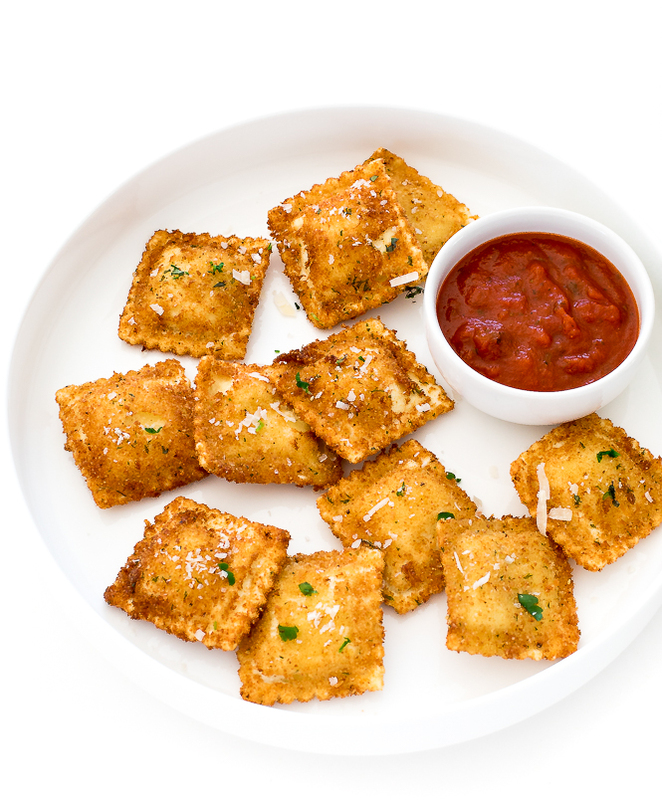 These Toasted Raviolis are so delicious and addicting. They are also super easy to throw together making them an awesome appetizer to serve at a party. Take your favorite raviolis (I did cheese) and dip them in an egg and milk mixture then in herb breadcrumbs. The raviolis get fried for 3-4 minutes or until they are golden brown. Top the Toasted Ravioli’s with grated parmesan cheese and fresh chopped parsley. Serve with a side of marinara sauce for dipping! Add milk and eggs to a shallow bowl and mix to combine. In another shallow bowl add breadcrumbs, parsley, oregano, garlic powder and onion powder and stir to combine. Dip raviolis into the egg mixture then into the breadcrumb mixture making sure to coat both sides. Place the breaded ravioli on a baking sheet lined with parchment paper. Place in the freezer for 30 minutes. Meanwhile fill a large pot with at least 2 inches of oil and heat to 350 degrees F.
Remove ravioli from the freezer. Working in small batches cook the raviolis for 3-4 minutes. Place the raviolis on a plate lined with paper towels and season with a sprinkle of salt and pepper. 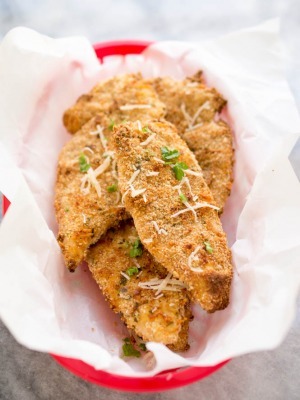 Serve immediately with parmesan cheese, fresh parsley and marinara sauce, if desired.